Complete guide to Changing of the Guard at Buckingham Palace with practical advice to help you be in the right place at the right time to see more of the ceremony than most visitors. 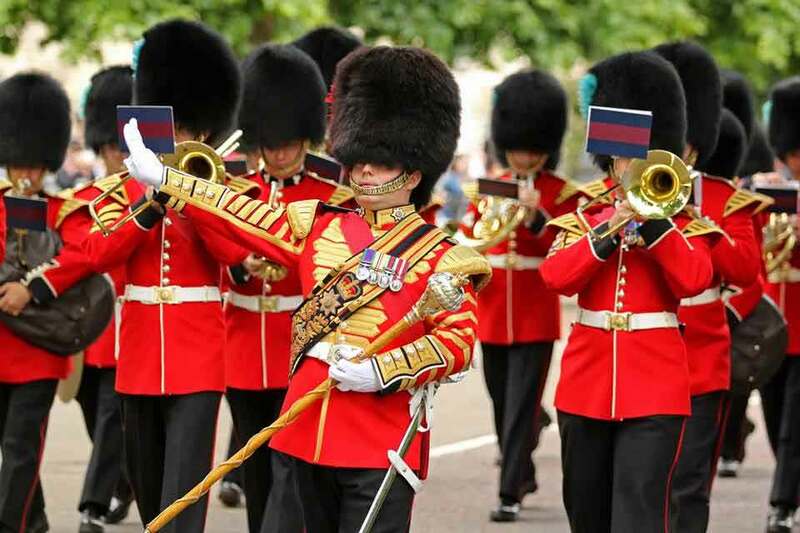 Immaculately turned out guards, precision drill and bands playing stirring music all combine to make Changing of the Guard one of London's most popular attractions that epitomises the pomp and military ceremony for which Britain is famous. Changing of the Guard at Buckingham Palace is the ceremony where The Queen's Guard hands over responsibility for protecting Buckingham Palace and St. James's Palace to the New Guard. Changing the Guard begins on the forecourt of Buckingham Palace at 11:00 sharp following a march by a detachment of the Old Guard, with musical support, from St. James's Palace and the New Guard led by a Regimental Band from Wellington Barracks. The Changing of the Guard ceremony lasts for approximately 45 minutes. The Queen's Guard is normally provided by one of the five regiments of Foot Guards from the Household Division, instantly recognisable in their bearskin caps and scarlet tunics. Musical support is provided by a Regimental Band or Corps of Drums with pipers occasionally taking part in the ceremony. The Guardsmen taking part in the ceremony are highly trained infantry soldiers, who in addition to their combat role undertake ceremonial duties. To get a good spot to watch Changing the Guard we recommend arriving at Buckingham Palace no later than 10:15. Read on for details of what you will see, where to stand, how to see more than most visitors, visiting with children and getting to Buckingham Palace by public transport. During the Changing of the Guard ceremony Police Officers are always present to ensure a safe and smooth event. If you are coming to watch, please do take care of your personal possessions at all times, as like many crowded places, pickpockets have been known to operate in this area. Please report any suspicious behaviour to a Police Officer. Further advice can be found on the Met Police website. Buckingham Palace, London, SW1A 1AA is where the Changing of the Guard ceremony takes place. Confirmed Dates & Times with details, of the Regiments and Bands scheduled for Changing the Guard. Changing of the Guard at Buckingham Palace is a ceremony steeped in history. In wet weather the Changing of the Guard ceremony can be cancelled, sometimes at the last minute. A long wait and standing in the huge crowds in front of Buckingham Palace can make a visit to the Changing of the Guard ceremony a daunting experience for younger children. To help younger visitors enjoy the experience try this suggestion. To see the entire Guard Mount and end up in the right place at the right time we recommend the award winning Changing the Guard Walking Tour from Fun London Tours. As an extra bonus you can save 10% on this fun packed tour by adding the discount code FUNGUARD10PC when you book a Changing the Guard Walking Tour. Buckingham Palace railings is the spot most try to grab when they visit the Changing of the Guard. Tip: Take a bottle of water, if you leave for a drink you will not get back to the front of the crowd. Victoria Memorial Standing on the steps is our favourite. There are other spots along the routes the guards take to and from the Palace where you can see 'The Queen's Guard' march past, while avoiding the huge crowds in front of Buckingham Palace. The Changing the Guard ceremony spans three locations; Buckingham Palace, St. James's Palace and Wellington Barracks. Where you can see more than the top of a bearskin cap over a sea of heads in front of Buckingham Palace. Most people head for Buckingham Palace to see Changing the Guard, but the ceremony actually takes place between three locations - Buckingham Palace, St. James's Palace and Wellington Barracks. The St. James's Palace detachment of the Old Guard forms up in Friary Court at 10:30 for an inspection by the Captain of The Queen's Guard. (St. James's Palace is situated off The Mall in Marlborough Road). This contingent will make its way down The Mall towards Buckingham Palace at approximately 10:25 preceded by a Regimental Band or Corps of Drums. The Buckingham Palace detachment, of the Old Guard, already on duty in the Palace, are inspected whilst awaiting the arrival of the St. James's Palace detachment. The St. James's detachment enters the Palace Forecourt via the South Centre Gate (left of centre facing the Palace) and takes up position beside the Buckingham Palace detachment on the left hand side of the forecourt. Now complete, the Old Guard awaits the arrival of the incoming New Guard from Wellington Barracks, which is situated at the Buckingham Palace end of Birdcage Walk. The New Guard undergoes its own inspection on the parade square at Wellington Barracks. While awaiting the arrival of the New Guard's Regimental Colour the band, accompanying them forms a circle and plays a selection of music. After saluting the Colour, the New Guard steps off from Wellington Barracks preceded by a Regimental Band at 10:57. At 11:00 the New Guard enters the Forecourt, via the North Gate (right of centre facing the Palace), they march in front of the Band and halt facing the Old Guard. The Band then performs the New Guard's Regimental Slow March as it advances towards the Old Guard. The Old and New Guards 'Present Arms' before the Captains of the Guard ceremoniously hand over the Palace keys. This symbolic gesture represents the transfer of responsibility for the security of the Palace's from the Old to the New Guard who, until relieved, will be The Queen's Guard. When The Queen is in residence The Foot Guards, on the forecourt of the Palace, will await The Queens Life Guard and 'Present Arms', (salute with their rifles), as the cavalry pass between the Queen Victoria Memorial and Buckingham Palace. After this salute the officers, of both the Old and New Buckingham Palace detachments, salute the Senior Captain on parade with their swords. Retiring to the guardroom, they will report to the Senior Captain after completing handover procedures with their Senior Non-Commissioned Officers. During this period the Ensigns, carrying their respective Colours, patrol the area before the Palace from left to right. Officers not directly involved in the ceremony march in step along the west side of the Guards. As each new sentry is posted, a Corporal distributes any special orders, previously collected personally from the Palace by the Captains of the Guard. During these procedures the Regimental Band, originally accompanying the New Guard, moves to the centre of the forecourt, forms a semi circle and perform a programme of music. Pipers who occasionally accompany the Old Guard, on the march from St. James's Palace, also provide music at this point in the ceremony. The original sentries, having been replaced by sentries from the New Guard, including those still on duty at St. James's Palace, return to complete the Old Guard. The duty bugler informs the Director of Music that the handover is complete. The band then reforms in front of the centre gates. At approximately 11:35 the Guards are called to 'Attention'. The Old Guard advances to its Regimental Slow March towards the New Guard. Wheeling right, the Colours of the Old and New Guard exchange compliments as the Old Guard exits through the Centre Gate preceded by the band. Having left the Palace, the Old Guard 'breaks into quick time' and continues its march back to Wellington Barracks. The New Guard, remaining in the Palace, is given the order to 'Slope Arms' and is referred to from this point as 'The Queen's Guard'. The Queen's Guard then divides into two. Those responsible for guarding St. James's Palace, usually led by a Regimental Band or Corps of Drums, march off down the Mall to place their Regimental Colour in the guardroom, located in Friary Court, at St. James's Palace. The Buckingham Palace detachment of The Queen's Guard then retires to the Palace Guard Room to assume their duties. 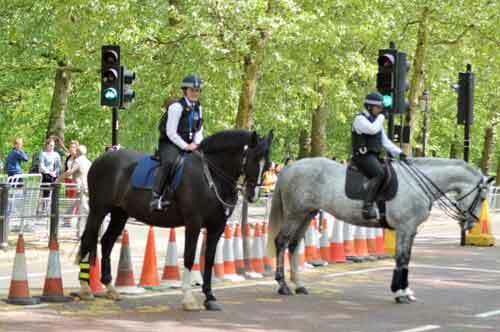 The guards at Buckingham Palace and St James Palace are on duty for 24 or 48 hours. During that time a Guardsman will have 2 hours on sentry duty and then 4 hours off. Sentries are not permitted to stand easy whilst at their post, indeed it is in the orders for the sentry that are read out to them at the beginning of their 'tour of duty', "you may not eat, sleep, smoke, stand easy, sit or lie down during your tour of duty". Foot Guards are trained on how to deal with threats and nuisances from the public. The first way they do this is by coming to attention, as the crash of a studded ammo boot striking concrete, is a good way to grab attention, and this is usually accompanied by a shout of 'Stand back from the guard' or something similar. Should the nuisance persists the sentry repeats the above and moves his weapon , to the slope with a similar shout. The final warning is to issue an official challenge to the person. The sentry will slope arms and then move the weapon into a position called 'port arms' where the weapon points at the person. This is considered the final warning and the next step would be for the sentry to either detain the person or seek assistance. If there is a threat from arms or other weapon, the sentry can seek, or in some cases already have, permission to discharge their weapon to stop the assailant. There have been no recorded discharging of weapons from sentries on public duties. Should members of the public get in the way of the Foot Guards, The Guards will not march around them. The usual phrase to make people move is "Make way for the Queen's Guard". We hope our website helps you enjoy your visit to Changing the Guard at Buckingham Palace, but please don't hesitate to get in touch if you need more information, or check out the FAQ Pages for answers to the questions other visitors have asked.